Families with toddlers do not have to avoid theme parks altogether. Instead, choose one that is planned and designed exclusively for younger children. Amusement parks can be a very fun place to visit during the warmer months. With toddlers and younger children however it can be more of a challenge. Although most amusement parks dedicate a section to little kids, problems such as toting a toddler around the park can be a problem. Additionally, many tykes become overwhelmed and over stimulated by all of the rides and the number of people in the park. Several parks throughout the United States cater especially to the littlest of patrons. Although these parks are wonderful for toddlers and younger children, they are not suitable for the older kids. Older children and teens may become bored quickly as there are very few activities at these parks that are appropriate for children over the age of 7 or 8. Parents should arrive early, ensure sun protection for children, dress children appropriately and be prepared for the unexpected when going to the theme park with kids. Sesame Place - Langhorne, PA – Perhaps the most popular of toddler friendly amusement parks, Sesame Place is located in Bucks County, about 30 minutes from Philadelphia. Named for it's theme (that is the PBS show Sesame Street), Sesame Place is home to all of the residents of Sesame Street including Big Bird, Grover, Elmo and Cookie Monster. While at the park one can enjoy various amusement rides (including a roller coaster, train and carousel), musical shows, games and water attractions. All of the rides and attractions are appropriate for young children. Super Grover's Vapor Trail might well be your first roller coaster ride as an entire family. Sky Splash, topped by a giant Rubber Duckie, is a water ride with rafts for a family of six. The park provides a few different dining options. One can go for a quick meal such as a hamburger or hot dog with chips. Unlike some of the other toddler friendly parks (that offer only enough entertainment for half a day), Sesame Place is perfect for a 2 or 3 day vacation get away. Santa's Village - Jefferson, NH – At this theme park, it is Christmas all year round. Activities at this park include various rides such as a Christmas carousel, bumper cars, ferris wheel, water rides and more. Additionally there are interactive games and craft activities, a theater and fun shops to visit. Families can enjoy a wide array of both snacks and meals including burgers/fries, chicken, pizza, gingerbread, fudge and cotton candy. The park is open from mid-May through December (check with the park in advance as days and hours of operation vary throughout the year). Admission to the park is $24 for patrons over 4 years of age, and free for tikes under 4. Adventure City - Anaheim, CA – The Little Theme Park That's Big on Family Fun features 17 rides and attractions including the new 3 1/2 story roller coaster "Tree Top Racers." Also features Thomas the Tank Engine and Friends play area, the petting farm, the 25-foot climbing wall and so much more. Reasonably-priced food is available for refueling. There is little room for doubt that the local Disney theme parks and Knott's Berry Farm are world-class fun centers. But for the 10-and-under set, and their parents, Adventure City may be the best all-around amusement park experience. Adventure City is small, inexpensive, and packed with young-kid oriented rides and attractions. Pixieland Amusement Park - Concord, CA – Designed for children ages toddler up to 10 years old, Pixieland Amusement Park features a miniature train, carousel, roller coaster, tea cups, airplanes, frog hopper, antique cars, games, and refreshments. Sonoma TrainTown - Sonoma, CA – TrainTown is located in the Heart of Wine Country. This is a one-and-one-quarter-mile scale railroad adventure with narrow-gauge train replicas of those back in the good old days. The park also has a roller coaster, ferris wheel and carousel that are just the right size for your toddler. Just look for the actual train cars that form the front gate – and don't forget to go inside and get a feel for what it is like to ride in an iron horse. 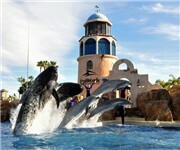 SeaWorld, San Diego, CA – At 189 acres, SeaWorld offers something for every age child, from sea lion shows that will delight the under-six crowd to rides exciting enough to please older kids such as the Shipwreck Rapids. And, it's about as educational and hands-on as theme parks can get. Local parents agree that to get the most out of SeaWorld, try to go during the off-season, that is, not in summer, and plan to arrive as the gates open. Memphis Kiddie Park - Brooklyn, OH – This small amusement park on the outskirts of Cleveland is great for a Saturday get away. The park offers a variety of activities for young children including a carousel, train, tiny roller coaster and ferris wheel. One can purchase snacks inside the park such as peanuts, hot dogs, popcorn, etc. 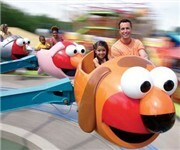 Similar to that of theme parks of the past, guests to the park purchase tickets to ride or participate in activities. Elitch Gardens - Denver, CO – The oldest theme park west of the Mississippi, Elitch Gardens offers everything from its 75-year-old carousel to Disaster Canyon and Shipwreck Falls. Elitch Gardens has rides and entertainment for all ages. The price of admission to Elitch Gardens also includes admission to The Water Park, which also has an area for children and families. Deer Forest Park - Coloma, MI – Located about 15 minutes outside of Benton Harbor, Deer Forest is both a comfortable and fun destination for toddlers. The park offers a petting zoo, toddler friendly rides such as the tree top ferris wheel, pony rides, miniature golf and a train ride. As with most toddler friendly theme parks, parking at Deer Forest is free and in close proximity to the park's entrance. Light meals/snacks such as hot dogs, peanuts, etc. are available inside the park. Admission along with a pass for all amusement rides costs $14 for the day. This park is very small, low budget and simple. Disneyland, Movie World, Sea World. Most kids would do anything for a chance to go to any of these theme parks. However, many parents with young kids shy away from such family holiday destinations because the crowds can be intimidating and the long wait for rides can turn happy kids into rowdy kids. Fortunately, with a bit of planning, a trip to the theme park with young kids shouldn’t be a problem. Here are some useful tips for parents when visiting big amusement parks with their children. Try to reach the theme park early, preferably in the morning. There are several reasons for this – kids tend to behave better early in the day, the crowd isn’t that big just yet, the queues for popular and newer rides are much shorter and sun damage is minimal compared to in the afternoon. Arriving early at the theme park is also important if the tickets have not been pre-purchased through a travel agent or the Internet as time will be wasted waiting to buy theme park passes. Sun protection is crucial for everyone, particularly children. Get all family members to apply a sunscreen with SPF 15 to 30 before stepping out in the sun, wear wide brim hats and sunglasses with UV protection. Encourage children to look for shade in the form of trees, buildings and umbrella whenever possible. For babies in strollers, use a sun protector or drape a sheet over the stroller to avoid direct sun exposure. Don’t let children wear their best clothes at the theme park. Instead, dress them in loose, comfortable clothing that can dry out quickly if they get wet. As there will be lots of people in the theme park, it’s a good idea to get the kids to don clothes that stand out in the crowd. Brightly colored clothes and hats or t-shirts with a unique family theme are very useful if the kids accidentally become separated from their parents. They will be much easier to spot.